Gripsweat - ASD 429,CREAM/GOLD, GIOCONDA DE VITO, BACH/MOZART VIOLIN CONCERTOS,KUBELIK,RARE! ASD 429,CREAM/GOLD, GIOCONDA DE VITO, BACH/MOZART VIOLIN CONCERTOS,KUBELIK,RARE! 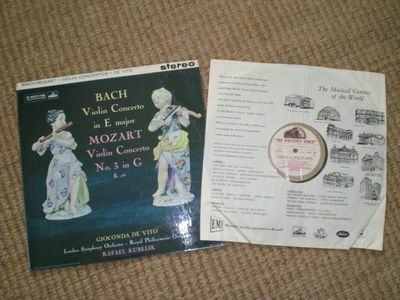 HMV ASD 429, cream /gold label, 1961, Gioconda de Vito, Bach/Mozart violin concertos. This record is in excellent condition and appears as though it has never been played. There are no marks on the record and no spindle marks in the middle. There is some faint discolouration on the cover and a small tear halfway down on the opening cover. Stamped in the middle of the record are the following numbers : 2 YEA 460 -1 and 2 YEA 459 - 2. The record is 'as found' and I have not cleaned or played it. Apologies that I have not been able to post more photos of the middle of the record. I tried but the photos were awful, not sure whether it was me or the camera, sorry ! An extremely rare record apparently …..
Postage in the UK : FREE. Postage overseas 20 GBP, SIGNED FOR.